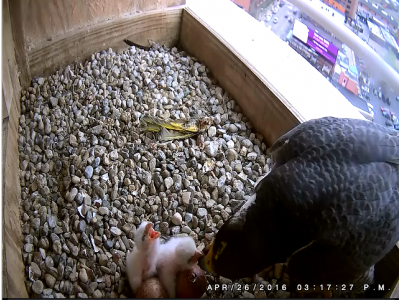 The first two eggs hatched on April 26, 2016, right on schedule, 30 days from the date of the last egg laid. One other egg has a pip where the chick has started to peck a hole, so the family will grow quickly. The first two chicks are hungry and look healthy and alert.